The second lake I visited on my brief visit to Romania makes it almost impossible to avoid mentioning two of Romania’s most infamous citizens. Lacul Snagov, about 40 km north of Bucharest, is surrounded by the weekend villas of Romania’s current and past elite, including the notorious Nicolei Ceauşescu. 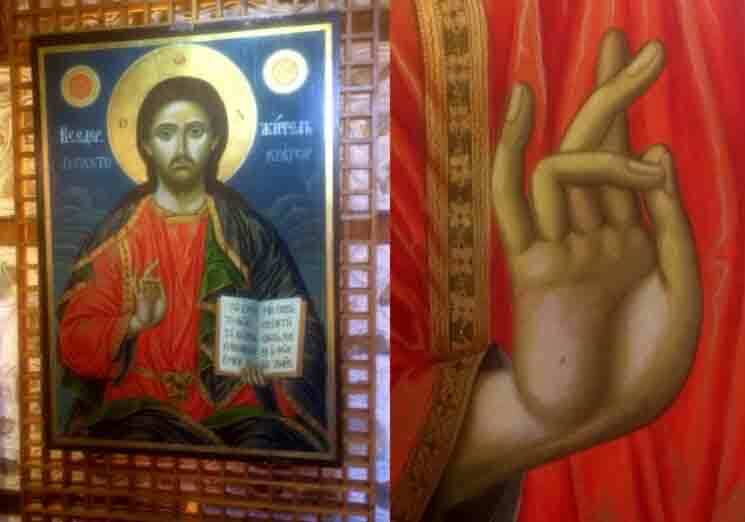 That connection, however, pales beside that of a monastery on an island in the lake, reputed to contain the grave of Vlad the Impaler, better known to the rest of the world as Dracula. This is mostly due to Bram Stoker’s novel although he never actually visited Romania. 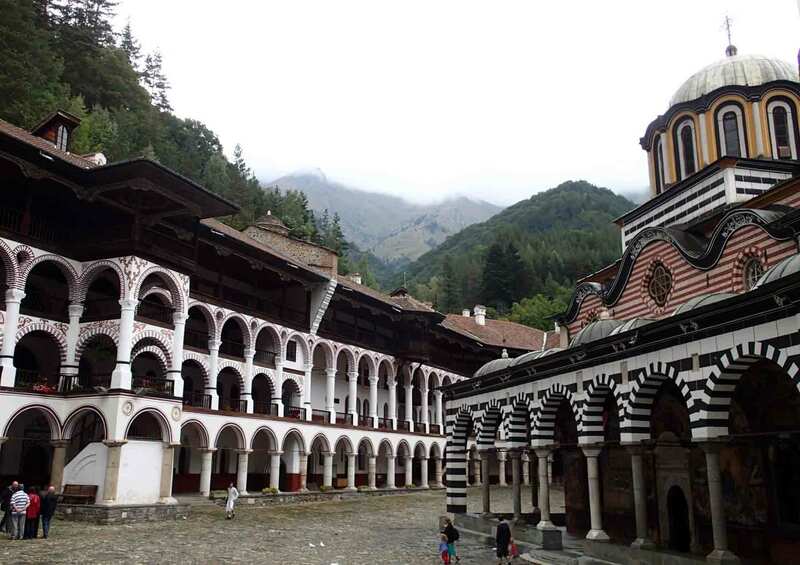 His interpretation of the Dracula legend was based partly on hearsay, but largely on his own vivid imagination, much to the despair of modern Romanians. Whereas Lacul Cāldāruşani had turbid phytoplankton-rich water, Lacul Snagov was much clearer, with a varied assortment of submerged plant visible below the surface as we travelled across the lake in an inflatable boat. Large areas of the surface were covered with water lilies, a mixture of Nymphaea alba, the common white water lily, and, of more interest to me, the Indian lotus, Nelumbo nucifera. As the name suggests, it is native to Asia: I have seen this growing in Bangladesh, and eaten it in Korea and China, but here it was growing in abundance in a European lake. The term “invasive species” has been applied to Indian lotus but, like many visually attractive plants, the “invasion” was helped by human agents. 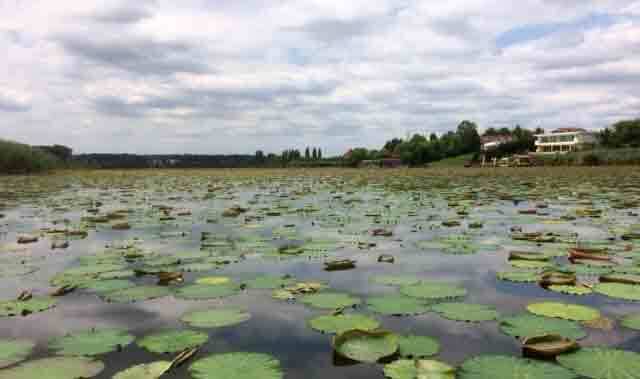 Records of lotus in Snagov go back to 1955, and now it covers large areas of the lake surface. There is some evidence that the spread of Nelumbo nucifera has altered the composition of other plants in the lake, albeit without detracting seriously from the visual aesthetics (see image above). The topic of invasive plants and animals is controversial, and is one that can make usually mild-mannered ecologists sound like rabid xenophobes. I enjoyed Ken Thompson’s recent book “Where do Camels Belong?” which questioned the whole concept of a “native species” in an ever-changing landscape. If you cannot define a “native” species securely, argues Thompson, then nor should we rush to attach labels such as “invasive” or “alien” to non-native species. Judge each on its merits. And Nelumbo nucifera does have several merits. There is the rather beautiful flower for example and, lurking in the bottom muds, a less attractive but very tasty rhizome. We rarely encounter it in western cuisine, or even in Chinese restaurants in the West, but you can buy it frozen from Chinese supermarkets. Were Europeans to follow the Asiatic lead, then a solution to this particular “invasive species” problem presents itself. This tangential line of thought started with a blog by my wife Heather on a native British species, Alliaria petiolata (garlic mustard) that happens to be regarded as an invasive weed in north America. Her internet searches led her to an entire cookbook devoted to ridding the world of this one weed (“From Pest to Pesto: Eat it to Beat it”) and I can vouch for the gastronomic qualities of British populations as a result. In the same vein, here is my first attempt at cooking and eating lotus roots, admittedly based on frozen, rather than foraged, lotus and inspired by my recent trip to China: boil about half a kilogram of (thawed) lotus roots for a few minutes, until just tender, drain and dry. Roast a tablespoon of sesame seeds until they are brown. Heat some sesame oil until hot, then stir fry the lotus roots along with two tablespoons of finely-chopped spring onions and a finely-chopped clove of garlic for a couple of minutes. 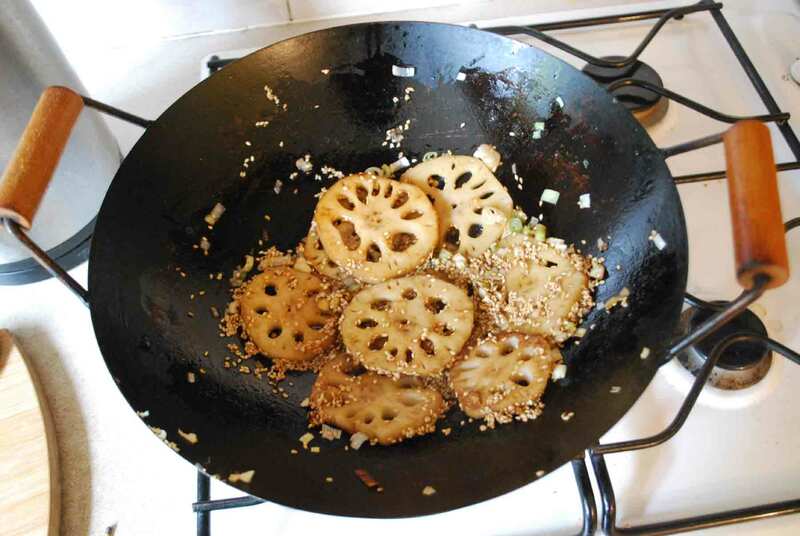 Add one or two tablespoons of light soy sauce (enough to coat the lotus roots) and finally stir in the sesame seeds. Stir it for another minute or so, then serve. Repeat this until the invasive species has disappeared. It’s called “biological control”. Anastasiu, P., Negrean, G., Başnou, C., Sîrbu, C. & Oprea, A. (2007). A preliminary study on the neophytes of wetlands in Romania. In: Rabitsch, W., F. Essl & F. Klingenstein (Eds. ): Biological Invasions – from Ecology to Conservation. NEOBIOTA 7: 181-192. Thompson, K. (2015). Where do Camels Belong? Profile Books, London. If you have followed my blog for some time you will know that two of my professional interests are ensuring consistency in the implementation of environmental legislation across the European Union and trying to make ecological assessment as straightforward and understandable as possible. These two interests sometimes collide briefly, particularly when I am travelling, as I have an urge to grab a sample from lakes and rivers that I pass and to make a quick judgement on their quality (see “Lago di Maggiore under the microscope” and “Subsidiarity in action”). This isn’t quite as straightforward as it seems, as my specialism requires use of a microscope, and travelling light precludes carrying my field microscope on my travels. Instead, I bring small, discrete samples home and have a look at the diatoms in their live state. Enough are usually recognisable to allow me to make a rough calculation of the indices that we use to evaluate ecological status. My visit to Romania included a trip to Lacul Cāldāruşani, on the flat lands of the Wallachian Plain about 40 kilometres north of Bucharest. It is a shallow lake, fringed by reeds (Phragmites australis) and it was from these that we collected our sample. The reed stems were all smothered with the green alga Cladophora glomerata which, in turn, hosted a rich diatom flora. Many of these could be either identified, or a plausible guess at their identity made, from the live state, so I was able to make a list of diatoms and, from this, to calculate the indices that we use in the UK to assess the quality of lakes. 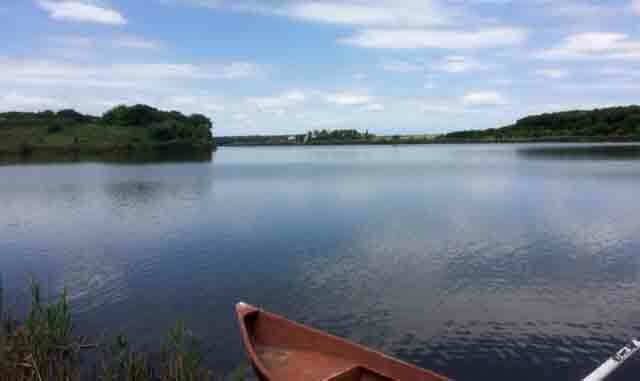 My conclusion was that that this was definitely an enriched lake, some way below the standards set by the Water Framework Directive, which agreed with the evidence that my Romanian hosts already had. That I can travel from near the western edge of the European Union to the eastern edge and still make a robust inference of the quality of the lake says much for the robustness of the methods with which we are dealing. The most abundant diatom in the sample was Cocconeis pediculus, which lives on the surface of the Cladophora filaments. This means that it is, in this case at least, an epiphyte on an epiphyte, as the Cladophora was, itself, growing on the reed stems. 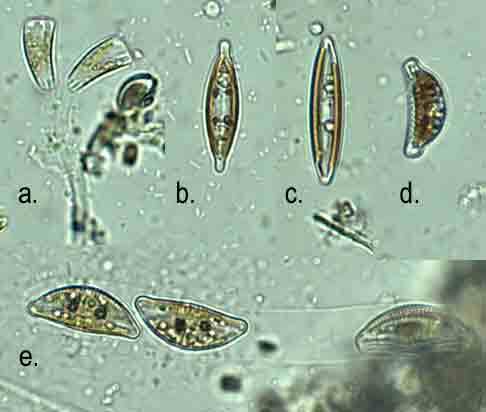 Rhoicosphenia abbreviata is another diatom that lives epiphytically on Cladophora, and this was also common in the sample. As well as these, there were at least three species of Encyonema, mostly free-living but a few in tubes, plus Navicula tripunctata and at least one other species and a few cells of Epithemia sorex. There was also a rich assortment of green algae, but I had only limited time to dedicate to this sample, so these will have to wait for another day. Cladophora-smothered sections of submerged stems of Phragmites australis collected from Lacul Cāldāruşani, Romania, June 2016; b. and c. Cocconeis pediculus growing on living and dead filaments of Cladophora glomerata from Lac Cāldāruşani. Scale bar: 10 micrometres (= 1/100th of a millimetre). Diatoms from Lac Cāldāruşani, Romania, June 2016: a. two cells of Rhoicosphenia abbreviata on a stalk; b. Navicula sp. ; c. Navicula tripunctata; d. Epithemia sorex; e. Encyonema sp (E. silesiacum?) growing in mucilaginous tubes. Scale bar: 10 micrometres (= 1/100th of a millimetre). One difference between this lake and most lakes in the UK is that the Romanians have a taste for a far broader range of freshwater fish than we do. We enjoy salmon and trout, but there is not much enthusiasm for eating other freshwater fish here, in contrast to many parts of central and eastern Europe where fish such as carp are both farmed and eaten (we, in the UK, seem to have lost that taste, as many ruined monasteries have “carp ponds”). Lac Cāldāruşani has a commercial fishery, and this probably contributes to the poor quality of the water. Many shallow lakes and ponds are stocked with carp in the UK too, but for angling, not commercial fisheries. Many of these are too small to feature on the regular monitoring programs (which only covers water bodies that are at least 50 Ha in size). Carp, however, are fish that like to root around in the mud for food and, in the process, stir up the sediments releasing nutrients back into the water where they can be used by algae. The algae, in turn, die and sink to the bottom where they decay and release the nutrients back to the water, only for another carp to stir them up again. These shallow lakes are, in effect, not just polluted by this year’s inputs of nutrients, but also by pollution from the preceding decade, which is constantly being recycled as the fish search for food. From here, we climbed back into the car to visit one other lake. The story of that lake, however, will have to wait for a future post. Bennion, H., Kelly, M.G., Juggins, S., Yallop, M.L., Burgess, A., Jamieson, J. & Krokowski, J. (2014). Assessment of ecological status in UK lakes using benthic diatoms. Freshwater Science 33: 639-654. Kelly, M., Urbanic, G., Acs, E. Bennion, H., Bertrin, V., Burgess, A., Denys, L., Gottschalk, S., Kahlert, M., Karjalainen, S.-M., Kennedy, B., Kosi, G., Marchetto, A., Morin, S., Picinska-Fałtynowicz, J., Poikane, S., Rosebery, J. Schoenfelder, I., Schoenfelder, J., Varbiro, G.(2014). Comparing aspirations: intercalibration of ecological status concepts across European lakes for littoral diatoms. Hydrobiologia 734: 125-141.